SINGLE by Sunday can't wait to wow their crowds with their infectious pop rock this Saturday January 7 at Glasgows 02 ABC. 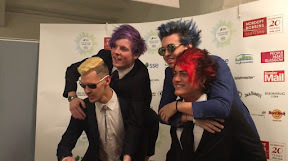 TheShowbizlion.com caught up with the Scots talents just before the New Year at the Scottish Music Awards when they were buzzing to mingle with people like Twin Atlantic. The lads said: "A lot has happened in a year and now we are headlining the O2 and we are releasing our third EP." The boys have grown a huge fan base over the last twelve months and recently had to be taken away by the police after fans got over excited. Lead singer Josh explained: "We were at a gig in East Kilbride and the police had to come and help us out. We’ve got the best fans in the world, they're so supportive and we couldn’t believe how many people turned up. It was crazy." The new EP includes previously unheard tracks ‘It Is What It Is’, ‘Never Ever Ever’, ’22.5.16’ and ‘I Can’t Go On Like This’.